Plans are well underway towards ground being broken for our new video recording studio at the home office in Cincinnati. We are now at the stage of securing building permits from both Miami Township and Clermont County. 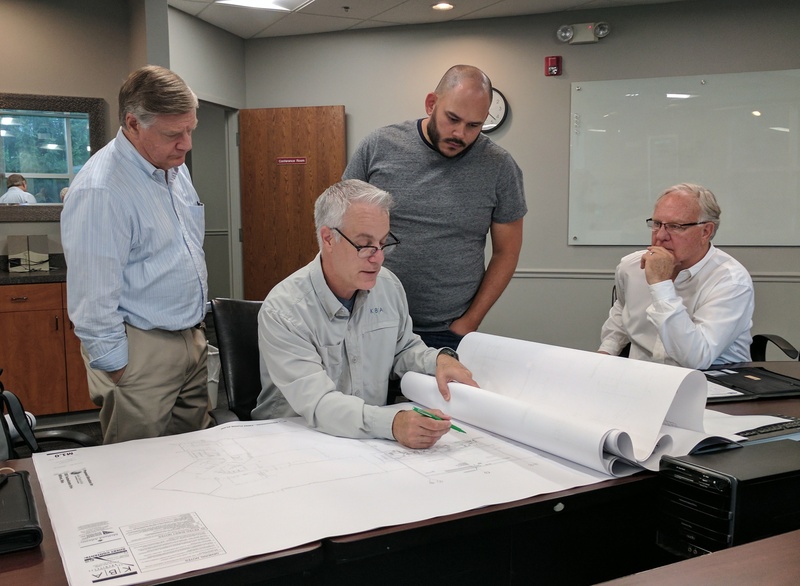 Peter Eddington and Rudy Rangel look at the new addition plans with Mark Bredemeier and Mike Barnard. Electrical and mechanical drawings have been drafted and approved, and the architectural plans have been finalized. Design and build services for construction are now out to bid. Once construction actually commences, plans for the on-camera set and other studio components will be finalized. We look forward to sharing those plans and designs with you as they get underway. As you can imagine, we are very excited with the opportunities the new facility will give us in being more effective in our work to preach the gospel of the Kingdom! When completed we will have a very fine video recording facility that will be extremely flexible in fitting our needs. We even plan for enough space for a studio audience and live webcasting capability.